The Alumnus Summa Laude Dignatus Award (ASLD) is the highest honor bestowed upon a University of Washington graduate and is presented annually by the UW and UW Alumni Association. It recognizes a legacy of achievement and service built over a lifetime. Since its inception in 1938, more than 70 alumni who personify the University’s tradition of excellence have received this prestigious honor. Nominations are open to the public. More than 70 alumni who personify the University’s tradition of excellence have received this prestigious honor since the award was inaugurated in 1938. The list includes Nobel Prize winners, internationally-recognized scientists, artists, business leaders, educators and many other important figures. 2017. The Honorable Norman B. Rice, ’72, ’74 – The Evans School grad and former mayor helped revive downtown, improve schools and build a community we are all proud of. Throughout his varied career—politician, banker, nonprofit executive—Rice has maintained a close connection to the UW, especially with the Evans School. He has served on the school’s advisory board and as a distinguished practitioner-in-residence overseeing the Civic Engagement for the 21st Century Project. “No one exemplifies the impact of an Evans School graduate better than the Honorable Norman B. Rice,” says Sandra Archibald, dean of the Evans School. “He has always led with a focus on collaboration, courage, respect, and integrity; it’s no wonder that he engendered such broad public support during his many years of public service and beyond. 2016. The Honorable Sally Jewell, ’78 – Sally Jewell has made her mark across the globe — from the University of Washington to Washington D.C; from Snoqualmie Pass to Kilimanjaro — as Secretary of the Interior, CEO of REI, UW Regent and more. Jewell graduated with a degree in mechanical engineering in 1978. In both the private and public sector, she has built a career combining sound engineering practice with her strong environmental values. Appointed by President Obama as Secretary of the Interior in 2013, she leads an agency of over 70,000 employees that serves as steward of 20 percent of the nation’s lands. She has been a strong and effective advocate for American Indian and Alaska Native tribes. Jewell has helped create the Husky leaders of tomorrow, mentoring students directly through the Foster School’s MBA mentor program and the College of Engineering’s Women in Science and Engineering Program. 2015. The Honorable Norman D. Dicks, ’63, ’68 – The winner of 18 consecutive terms as Congressman for Washington’s 6th District (1976-2012), Norm Dicks’ has a legendary “roll-up-your-sleeves” ethos. As a longtime member of the House Appropriations Committee, Dicks wielded real power in funding projects in the areas closest to his heart: the environment and defense. Dicks played linebacker for the Huskies, including the 1961 Rose Bowl-winning season, and graduated from the UW with a B.A. in political science in 1963 and a J.D. in 1968. Before taking office, he worked as legislative aide and administrative assistant for Sen. Warren Magnuson, ’29, from 1968 to 1976. 2014. Art Levinson, ‘72 – A rare combination of dedicated laboratory experience and business leadership launched Art Levinson, ’72, into the upper echelons of the biotechnology industry. Beginning as a research scientist at Genentech in 1980, Levinson was named CEO of the company, a forerunner in recombinant DNA, in 1995. Much of his professional research has focused on genes and proteins essential in creating cancer-fighting drugs. A successful transition from the lab coat to the suit coat made Levinson one of Baron‘s “World’s Most Respected CEOs” in 2006. In 2008, the American Academy of Sciences elected him a Fellow. He is currently the CEO of Calico, a startup addressing aging, and the chairman of Apple, Inc.
2013. William H. Gates, Sr., ‘49, ‘50 – As a successful lawyer, author and widely renowned philanthropist, Bill Gates Sr. has been committed to public service for more than six decades. Having worked on the boards of countless organizations–including three terms as a member of the University of Washington Board of Regents–his leadership and commitment to social justice, economics and global health are highly regarded by the community, the region and the world. Currently, he is an honorary co-chair for the World Justice Project and a co-chair of the Bill and Melinda Gates Foundation. 2012. Steven M. Holl, ‘71 – One of America’s most celebrated architects, Steven Holl has made a career out of upending expectations and breaking rules. His notable works include the Linked Hybrid mixed-use complex in Beijing, the Kiasma Museum of Contemporary Art in Helsinki, and the Chapel of St. Ignatius in Seattle, and he has projects under construction on three continents. Holl continues to win prestigious competitions, and in December, 2011, the American Institute of Architects awarded him is highest honor, the 2012 AIA Gold Medal. 2011. Jane Lubchenco, ‘71 – Attention to detail and willingness to tackle the big questions, leavened with what her former adviser and UW Professor Emeritus of Zoology Robert Paine calls “a lot of charisma,” have vaulted Lubchenco to the top of her profession as a marine ecologist. These qualities have made her an effective advocate for greater scientific engagement with policymakers and the general public, and led President Barack Obama to nominate her to be the first female administrator (and ninth overall) of the National Oceanic and Atmospheric Administration (NOAA), where she has served since March 2009. 2010. Bruce Nordstrom, ‘55 – Bruce Nordstrom’s contributions to the retail world have transcended the business realm and have contributed richly to American culture. The “Nordstrom Way” has become a blueprint for service in both the private and public sectors. Locally, Bruce Nordstrom has been a committed citizen, volunteering on local boards such as Children’s Hospital and Seattle Goodwill Industries and receiving an award for excellence in public service from YWCA in 2004. 2009. Wayne Quinton, ‘59 – For his prolific, groundbreaking work as an instrument designer for the UW’s medical school, and for his singular role in marrying the fields of engineering and medicine, Wayne Quinton is a transformative figure. His perseverance helped propel Quinton from small-town Rigby, Idaho, to big-time Boeing, where he landed one week after the attack on Pearl Harbor to work on the B-29 bomber. At the UW medical school, he not only designed a laundry list of life-saving medical devices, but became the first practitioner of an entirely new field: bioengineering. 2008. Beverly Cleary, ‘39 – Beloved children’s book author Beverly Cleary is known for her phenomenal memory, her flawless eye for detail and ear for dialogue, her exquisite timing and her economical prose. Each of her 30-plus children’s books is a master class in effective storytelling. But the quality that perhaps most distinguishes her is a willingness to let children be who they are. 2007. Daniel J. Evans, ‘48, ‘49 – Aside from serving three successful terms as governor of Washington, Dan Evans has given the state five years of able representation in the U.S. Senate, eight years in the state House of Representatives, six years as president of the Evergreen State College, twelve years on the UW Board of Regents, and a lifetime of loyalty. 2006. Linda Buck, ‘75 – A tenacious and resourceful scientist, Linda Buck was honored with the 2004 Nobel Prize in Physiology or Medicine for her groundbreaking investigations into the human sense of smell. While a postdoctoral student at Columbia University, Buck and her advisor Richard Axel broke the field of olfaction wide open by identifying the “odorant receptors” that allow people to detect and distinguish smells. Later, as a professor at Harvard, Buck made significant further discoveries about the way odors are processed by the nose and brain. She is currently a member in the division of basic sciences at the Fred Hutchinson Cancer Research Center and an affiliate professor of physiology and biophysics at the UW. She is also a member of the National Academy of Sciences. 2005. Jack Lenor Larsen, ‘49 – Mr. Larsen, internationally known textile designer, author, and collector, has been a major influence in environmental design throughout his long and successful career. Known as an innovator in fabric design, he has won many awards and is one of only two design houses ever to be honored with an exhibition at the Palais du Louvre. More than a weaver, Mr. Larsen is a scholar, world traveler, and one of the world’s foremost authorities on traditional and contemporary crafts. 2004. Bonnie J. Dunbar, ‘71, ‘75 – Ms. Dunbar is currently a deputy director in the Biological Sciences and Applications Division of NASA’s Space and Life Sciences Directorate where she spends much of her time on biotechnology research for the space station and future space exploration. She is one of the most experienced female astronauts in history, having spent 50 days in space and covering 20 million miles in five space shuttle flights. Ms. Dunbar is active in education outreach focusing on the promotion of science education to underrepresented populations. 2003. William Bolcom, ‘58 – Mr. Bolcom is a distinguished composer and pianist, renowned both nationally and internationally. Among his many honors and awards, Mr. Bolcom received the Pulitzer Prize for Music in 1988 for 12 New Etudes for Piano. He has recorded over 40 albums and his works are now performed throughout the world, and by world-class orchestras, opera houses, chamber musicians and soloists. His own compositions have been recorded by many illustrious artists, and first-rate orchestras. 2002. Donald Baker, ‘60 – Mr. Baker transformed the vision and mission of the University of Washington by taking academic research into the field of medical imaging and commercializing it to the great benefit of people throughout the world. With his work that made ultrasound imaging feasible, Mr. Baker became an entrepreneur who led bioengineering to the forefront of the healthcare industry, which resulted in saving numerous lives by enabling diagnosis and significantly improving the accuracy of diagnosis of disease and conditions. 2001. Joseph Sutter, ‘43 – Often referred to as the “father of the 747”, Mr. Sutter has been the pillar of the aerospace engineering community for many years. He has had a lifetime of accomplishments and contributions to the advancement of commercial jet transport aviation. 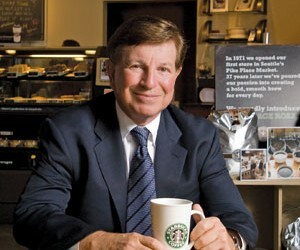 He served as a Boeing executive and retired as executive vice president in 1986. He now serves as a consultant to Boeing Commercial Airplane Group. Recipient of the U.S. Medal of Technology, he also served on the presidential committee that investigated the Challenger explosion. 2000. Rita Colwell, ‘61 – Dr. Colwell was the first woman to become the Director of the National Science Foundation. She is one of the world’s leading researchers into the epidemiology of cholera; she is renowned for her work in environmental control of epidemic diseases. She held high-level positions at Canada’s National Research Council and Georgetown University before becoming President of the University of Maryland’s Biotechnology Institute. She has also served as the president of the American Society of Microbiology and as the Chair for the Board of Governors of the American Academy of Microbiology. 1999. James R. Ellis, ‘48 – Ellis has devoted his life to improving the quality of the Pacific Northwest. He became known as “the man who cleaned up Lake Washington.” He was an energetic chair of Forward Thrust, which secured authorization of the Kingdome, many parks and a county-wide public transit system. He is respected nationally as an exceptionally capable and creative municipal bond lawyer. Ellis served as a chairman of the Section of Urban, State and Local Govern-Government Law of the American Bar Association. He served as a UW Regent for 12 years. 1998. Shirley Mahaley Malcom, ‘67 – Dr. Malcom was one of the first, if not the first, African American to earn a bachelor’s degree in Zoology from the University of Washington. She is the Head of the Directorate for Education and Human Resources Programs of the American Association for the Advancement of Science (AASS). She has made significant contributions to diversifying the technological workforce and supporting stronger technical education for all students. In the U.S. today, Dr. Malcom is the most effective and knowledgeable expert on issues concerning access and opportunities in science and engineering for ethnic minorities. 1997. Chuck Close, ‘62 – In an original working method based on gridded photographs, Close created oversized portraits of family and friends that quickly made him one of the best-known figures in contemporary American art. His works are shown all over the world in many major museums and private collections. At the height of his career, he was stricken by a spinal blood clot that left him partially paralyzed. Nevertheless, he found ways to continue painting the large portraits that have become his life’s work. The paintings he has done while disabled are the most vibrant and compelling of his distinguished career. 1996. Martin Rodbell, ‘54 – Explored fundamental questions about how cells receive, interpret and act upon information. He conceived the idea of signal transduction and then discovered that a cellular molecule named GTP is crucial to the process described by that concept. His work has greatly enhanced our understanding of the process of life and promise to advance the treatment of disease as well. For his work, he was a recipient of the 1994 Nobel Prize in medicine. 1995. (None awarded) – Special presentation to Dr. William P. Gerberding on his retirement as UW President. 1994. Dr. William H. Foege, ‘61 – Worked with the Center for Disease Control to eradicate smallpox worldwide. During his tenure at the CDC, he helped to identify the causes of toxic shock syndrome and Reye’s Syndrome in children. Former executive director of the Carter Center of Emory University through 1993. Nominated by President Bill Clinton in 1994 to be executive director of UNICEF. 1993. Dale Chihuly, ‘65 – Influential and creative artist and teacher in the medium of studio glass. Founder of the Pilchuck School in 1971. Works included in the collections of the Corning Museum of Glass (NY), The Metropolitan Museum of Art (NY), The Museum of Contemporary Crafts for the American Crafts Council (NY), the Seattle Art Museum, and the Philadelphia Museum of Art. 1992. Thomas S. Foley, ‘51, ‘57 – Politician, served the State of Washington in Congress from 1964 to 1994, chair of the House Democratic Caucus from 1976 to 1980, House Majority Whip from 1981 to 1986, House Majority Leader from 1987 to 1989, and Speaker of the U.S. House of Representatives from 1989 to 1994. 1991. Virginia Beatrice Smith, ‘44, ‘46, ‘50, – Educator, former assistant vice president at the University of California, Berkeley, and former associate director of the Carnegie Commission on Higher Education. 1990. George Nakashima, ‘29 – World-renowned furniture designer and woodworker who, among other honors, was commissioned by the Metropolitan Museum of Art in New York City to produce a room for its Japanese Wing. 1989. George Kozmetsky, ‘39 – Business leader, educator, co-founder of Teledyne, first dean of the Graduate School of Business Administration at the University of Texas-Austin, executive associate for economic affairs for the University of Texas system, director of the IC2 Institute, and professor in the UT Health Sciences Department of Medicine. 1988. John E. Corbally, ‘47, ‘50 – Educator, president of the John D. and Catherine T. MacArthur Foundation, former president of the University of Illinois, former provost and vice president of the Ohio State University. 1987. Lauren R. Donaldson, ‘31 – Professor Emeritus, UW School of Fisheries, developer of the “Donaldson Trout” and the salmon run which returns each year to the School of Fisheries. 1986. George Hitchings, ‘27, ‘28 – Nobel Prize winner, biochemist responsible for the discovery of Imuran (a drug that suppresses the body’s tendency to reject transplant tissue), retired vice president of research, development, and medicine for Burroughs Wellcome, and former president of Burroughs Wellcome Fund. 1985. George W. Jeffs, ‘45 – Aeronautical engineer, space technology executive, major contributor to Apollo, Skylab and Space Shuttle programs, former president of Rockwell International Corporation’s North American Operations and former corporate vice president of Rockwell. 1984. George Tsutakawa, ‘37 – Internationally known artist and sculptor, and Professor Emeritus, UW School of Art. 1983. William B. Hutchinson, ‘32 – Surgeon and former president of the Fred Hutchinson Cancer Research Center. 1982. Robert A. Dahl, ‘36 – Academician, author, and Sterling Professor of Political Science at Yale University. 1981. Donald E. Petersen, ‘46 – Engineer, automotive executive, past president of the Ford Motor Company. 1980.Arthur R. Anderson, ‘34 – Inventor, industrialist, structural engineer, and authority on pre-stressed concrete. 1979. Dael L. Wolfle, ‘27 – Academician, author and government adviser on matters of science and public policy. 1978. John Steiner, ‘40 – Aerodynamicist and international leader in air transportation field. Former vice president of corporate product development for The Boeing Company. 1977. Victor B. Scheffer, ‘30 – Retired senior biologist for the U.S. Fish and Wildlife Service and naturalist, conservationist, and internationally recognized mammalogist. 1976. Angus Livingstone Bowmer, ‘30, ‘34 – Founder and retired producing director of the Oregon Shakespeare Festival in Ashland. 1975. Edwin Guthman, ‘44 – Nationally known journalist and editor of the Philadelphia Inquirer. 1974. Imogen Cunningham, ‘07 – Internationally known San Francisco photographer. 1973. (None awarded) – Special presentation to Dr. Charles E. Odegaard on his retirement as UW president. 1972. Andrew Felton Brimmer, ‘51 – Noted African-American educator and member of the board of governors of the Federal Reserve System. 1971. Chester Robert Huntley, ‘42 – Radio and television news broadcaster for National Broadcasting Company (NBC). 1970. Edward E. Carlson, ‘32 – Board Chairman and Chief Executive Officer of Western International Hotels. Later became Board Chairman of United Airlines. 1969. Dr. George J. Stigler, ‘31 – Nobel Prize winner. Noted economist and Charles R. Wahlgreen Professor of American Institutions at the University of Chicago. 1968. Dr. Paul B. Beeson, ‘29 – Eminent medical academician and clinician and Nuffiels Professor of Clinical Medicine at Oxford University. 1967. Dr. Bertram D. Thomas, ‘29 – President of Batelle Memorial Institute. 1966. Dr. Neal E. Miller, ‘31 – Leading behavioral scientist and professor of psychology at Yale University. 1965. Esther Mohr Raushenbush, ‘21 – President of Sarah Lawrence College, Bronxville, New York. 1964. Horace W. McCurdy – Industrialist, civic leader and past president and retired board chairman of Puget Sound Bridge and Drydock Company. 1963. Dr. James Gilliuly, ‘21 – Staff scientist for the U.S. Geological Survey and internationally famous geologist. 1962. Dr. Frank L. Horsfall Jr., ‘27 – Research scientist and president and director of the Sloan-Kettering Institute for Cancer Research in New York City. 1961. Dr. Richard E. Fuller, ‘24 – President and director of the Seattle Art Museum and eminent geologist. 1960. Minoru Yamasaki, ‘34 – Internationally known Detroit architect and Seattle-born Japanese-American. 1959. Samuel G. Baker, ‘25 – Leader in industrial chemistry and head of the Organic Chemicals Department of the Du Pont Company. 1958. Riley Harris Allen, ‘02 – Leader in journalism and editor of the Honolulu Star-Bulletin. 1957. Clair L. Egtvedt, ‘20 – Leader in aeronautical engineering and board chairman of the Boeing Airplane Company. 1956. William C. Newberg, ‘33 – Automotive engineer and president of the Dodge Division of Chrysler Corporation. 1955. Carrol M. Shanks, ‘21 – President of the Prudential Insurance Company of America. 1954. Welton D. Becket, ‘27 – Internationally known Los Angeles architect. 1953. Robert S. MacFarlane, ‘22 – President of Northern Pacific Railway Company. 1952. Walter B. Beals, ‘01 – Eminent jurist and former Washington State Supreme Court Justice. 1951. Dr. Alfred S. Strauss, ‘05 – Famed surgeon. 1950. Charles William Harris, ‘03 – UW Professor of Engineering and leading authority on hydraulic engineering. 1949. Dr. Henry Schmitz, ‘15 – Professor of Forestry and Dean of College of Agriculture, Forestry and Home Economics at the University of Minnesota; President of the University of Washington 1952-1958. 1948. Kenneth C. Collins – Advertising and public relations executive and vice president of the Burlington Mills Corporation of New York. 1947. Edward Weber Allen, ‘09 – Lawyer and international fisheries authority. 1946. Waldo L. Semon, ‘20 – World leader in industrial chemistry. 1945. Robert B. Irwin, ‘06 – Internationally known for his aid to the American Foundation for the Blind. 1944. Eric A. Johnston, ‘17 – Business and civic leader. 1943. Dr. Loyal Shoudy, ‘04 – Industrial medicine practitioner and researcher. 1942. Philip Gustav Johnson, ‘16 – Aviation engineer and executive. 1941. Dr. Temple Fay, ‘17 – Neurologist, surgeon and physician. 1940. Elizabeth Sterling Soule, ‘26 – Organizer and Director (and later Dean) of the UW School of Nursing. 1939. Henry Granger Knight, ‘02, ‘04 – Research scientist and head of the U.S. Department of Chemistry and Soils. 1938. Dr. Trevor Kincaid, 1899 – Distinguished scientist, UW professor of Zoology, “Father of the Pacific Northwest Oyster Industry,” and founder of the UW Friday Harbor Laboratories. The ASLD Selection Committee is composed of 12 individuals: Six representing the UW Alumni Association and six, upon the recommendation of the Office of External Affairs, representing the University of Washington. The committee meets in February to review all nominees. Selection is generally determined in late February or early March and the winner notified shortly thereafter. A former student who received a Bachelor’s Degree, a former student who received a graduate degree after not less than two years of resident study, or a former student who, in the opinion of the selection committee, is qualified for the honor. What has your nominee accomplished to gain national or international stature? How have your nominee’s colleagues recognized the accomplishments? How many people has your nominee’s accomplishments impacted? How wide is the impact nationally or internationally? How well known is your nominee to the general public? How have your nominee’s accomplishments made news? What is the quality and quantity of evidence of national recognition? Will your nominee’s selection bring national recognition to the UW? Has your nominee demonstrated a continuity of interest in some form toward the UW? What has your nominee done to enhance the prestige of his/her school, college, or department? Award recipients should be able to come to the University to receive the recognition at the Awards of Excellence ceremony and at commencement exercises in June of the year they are granted the award. No current faculty members or regents will be considered. Nominations remain active for 3 years. Nominations do not need to be re-submitted during this time. New supporting materials can be added to an existing nomination by emailing materials to Virginia Lerer at vlerer@uw.edu. In accordance with campus sustainability guidelines, the UWAA cannot accept paper copies of ASLD nominations. Deadline for nominations for the 2018 ASLD Award is Friday, February 8, 2019. Questions? Please contact Virginia Lerer at vlerer@uw.edu or 206-543-0540. Please fill out this form to submit a nomination for consideration. In accordance with sustainable campus guidelines, the UW Alumni Association cannot accept paper copies of ASLD nominations. Deadline for submissions is February 8, 2019. As part of your nomination, please email at least four or more supporting documents (articles, letters, websites, etc.) to vlerer@uw.edu. Please include “ASLD nomination” with the nominee’s name in the subject line. The Starbucks CEO was a business leader who knew how to treat people right.